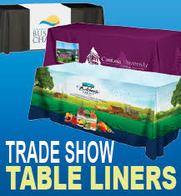 Trade shows are your company’s debut to a captured audience. 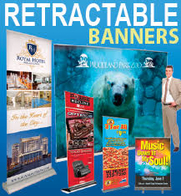 Your exhibit provides an excellent platform to enhance your credibility and visibility to customers, new and established. Each company has different goals for their participation at a trade show, but they all have at least one thing in common: Lead generation. Depending on your industry there may be dozens, if not hundreds of other booths competing to attract the same leads as your company. It is essential to maximize your lead generation capabilities. 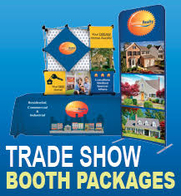 To do this, your booth requires a WOW factor! If you’ve ever been to a trade show as a spectator, think back to those moments as you walked through the aisles. What booths did you stop at and why? What made them more interesting compared to the booths you didn’t engage with? Chances are, the exhibits that caught your attention did something special, something that made them stand out in the sea of reps lining the aisles handing out brochures and business cards. I know when I visit a trade show, often times having dropped a significant amount of money for entry, I wanted to be impressed! To capture these potential new leads, you have to provide that potential lead with a reason to stop and engage with you. Despite the old saying, money really can make you happy! Even the sight of a big stack of cash gets my heart pumping. Seeing a large tube erected in the air with cash swirling around a person as they try desperately to catch the flying dough will certainly grab my attention. Using a Cash Cube sparks conversation, generates energy and attracts a crowd. 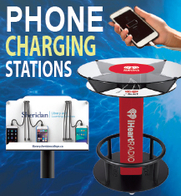 In today’s mobile connected world, a Cash Cube at your trade show booth is sure to be recorded on a mobile phone and uploaded to social media. That’s where customizing your Cash Cube becomes essential! Cash Cubes come in a wide variety of colors, sizes, shapes and different materials. 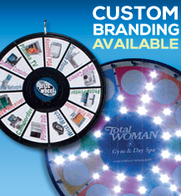 Ideally, you should have your company name and logo featured on the money machine for maximum exposure to your audience. We all know that games of chance get everyone interested. There is a reason that lotteries, casinos and wagering establishments make so much money; people love having a chance to win a prize. 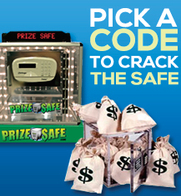 Cash Cubes offer just that; a fun way to win a great prize. Winners love to tell others that they won something and where they won it. 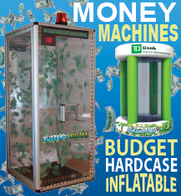 Providing an entertaining activity like a Cash Cube will deliver drones of people to your booth. When people are excited, they will be ready to chat with your sales reps. In all honesty, it would be silly, if not irresponsible to put real cash in your Cash Cube. Fill your money machine with your own custom coupon vouchers or play-money and make sure that these vouchers can only be redeemed for products and services offered by your company. 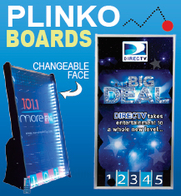 This helps to ensure that your company will get the most ROI from the Cash Cube when the winner redeems their promotional prize. 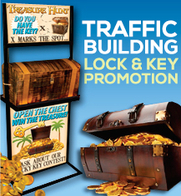 Capturing leads is easy when you have a Cash Cube. 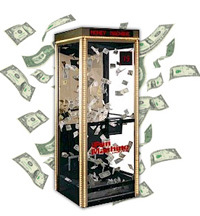 Its free to climb into the cash cube, all you need is a business card from each player prior to entry. No business card? No problem. Take names and contact info any way that works for your company. You will find that spectators will gladly hand over their contact information for the chance to be a winner in the Cash Cube.